I am not all the “crafty.” I honestly try…but I am more of a craft wannabee. My mother was an amazing sewer. Not this chick. My grandmother could crochet like nobody’s business. Not this chick. I somehow missed that gene. HOWEVER, I know many of my beloved readers ARE crafty and creative and I thought I would bring this hot sale to their attention. Over 2 million craft enthusiasts have joined Craftsy and experienced a new type of online education. With over 170,000 hours of classes watched per month, let’s celebrate learning! From 9/14-9/21, all courses and supplies on Craftsy are on sale up to 75% off! This includes classes, fabric, and yarn. Use the content below on your site and be sure to grab a text link and sale banner! But, you don’t have to take my word for it! Take advantage of the Craftsy sale to try one of their classes, starting at $9.99. The sale begins on Saturday, September 14th and runs through Saturday, September 21st. Craftsy Saleabration: Up to 75% Off All Courses, Fabric and Yarn! P.S: I you that I have been yippin about creating amazing shareable images with text for your blog, website or Pinterest for the last month. PicMonkey is my weapon of choice (read more HERE), but when it gets right down to it-it all starts with excellent photography. 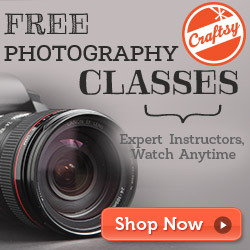 SO, I also noticed that Craftsy offers some very very good photography classes for anyone looking to take their image creation to the next level. Next Post Avast Matey!! Your Child’s Personalized Pirate Tale!